Hives come in all shapes and sizes…. Sustainable Bungay’s “Community Kitchen” crew got busy on Castle Meadow preparing a 2-course meal for 115 diners. Margaret leads the setup crew, organising tables and the exquisite Turkish-themed decorations to the venue. Angie and Terry spud-bashing before turning their hands to the finer aspects of preparing the feast. All of our fresh ingredients came from local smallholders and retailers. Josiah sourced (and cooked) quinoa from a farm he works with in Essex (contact <josiah@hodmedods.co.uk> if you want to buy some.) The recipe for our adaptation of Kiser is given below. Lewis got the job of prepping all the salads! Gemma and Christine with the lemony courgettes get ready for service. Lots of other volunteers make it possible for us to make a modest profit despite using top-quality ingredients and charging only £5 a head. Thanks to everyone who helped make this event such a success. We’re proud to say that by careful segregation of recyclables and compostables we consigned just 1 carrier-bag of rubbish to landfill in the process. Promoting low-carbon, community-focused lifestyle choices is a key part of Sustainable Bungay’s work. Soften the onion and garlic in the oil. Add the spices and cook for a few seconds. Add the salt and quinoa, tomato purée, honey and balsamic vinegar and mix well. Cover with boiling water, cover the pan and simmer gently for 15 minutes or until the quinoa is soft and the liquid absorbed. Take off the heat, add the walnuts, roughly chopped and set aside to cool. Fill the lettuce leaves with spoonfuls of the mixture and sprinkle with the chopped herbs. To celebrate our second birthday and make new friends Emmaus Norwich are holding a special bring and share birthday picnic. There will be picnicking, apple picking and harvest sharing, all washed down by birthday tea and cake. Bring a plate of food to share and a basket and keep your fingers crossed for good weather! (Do please bear in mind we have a no alcohol on site policy). Emmaus Norwich is a charity and business with a social purpose. We aim to offer a stable home, community and work for people experiencing homelessness. Our main activities are recycling and reusing all sorts of unwanted household items which we sell in our shop as well as online and at local auctions and street markets. We aim to rebuild lives and enable our residents, known as Companions, to achieve their aspirations in a supportive environment without the pressure of a fixed timespan. Our values are based on solidarity, helping others in our area as well as further afield around the UK and as part of a global network of over 300 local community led groups providing access to education and healthcare, clean water, freedom of movement and micro finance. At present we are small but have plans to grow over the coming months and are also in the process of preparing for an ambitious refurbishment of the former Victorian convent buildings here on our All Hallows site. Apple harvest day, Saturday 28 September, 11am – 4pm at Emmaus House, Belsey Bridge Rd, next to All Hallows convent, Ditchingham, Norfolk NR35 2DT.RSVP by 23 Sept on Ronagh@emmausnorwich.org or call us on 01986 895444. This Sunday 9th June Build Your Own Vegetable Growing Container at Bungay Library at 3pm. Plus planting ideas for vegatable pots and containers and friendly gardening chat ! The garden workshop will involve sowing seeds to grow your own Edible Bouquet, edible plant activities, gardening chat and an edible posy to take home. Please bring some seeds to share, examples: Nasturtium, Sunflower, Bergamot (Monarda Didyma) Sweet Violet, Borage, Primrose (Primula Vulgaris) Calendula (Pot Marigold) and herbs. All ages welcome, children must accompanied by an adult. A free garden workshop with donations kindly requested. Kings Seeds of Colchester kindly donated some seeds. Hasten the Spring along this Sunday March 17th and join in with a Garden Workshop, “Hot Beds and Leafy Greens”, at Bungay Library at 3pm. A chance to prepare container grown salad leaves to take home and to learn how to make a Hot Bed. There will be a taster session too and gardening chat. Bring along some salad/veg seeds to mix and share. 2013 is the year for Edible Plants in the central bed at Bungay Library Courtyard Garden. All ages welcome, children must be accompanied by an adult. This is a free garden workshop with donations kindly requested. With the determination of Cathy Proudlove and co-operation of Woodton Primary School a small group of us today spent an hour harvesting apples from the tree in the playground. These will be brought along to the Green Dragon tomorrow night, 7.30pm for conversation on – appropriately – Community Orchards. Hope to see you there. As part of our ongoing “Abundance” work we are holding another autumn produce exchange at the Library Courtyard on Sunday 16th September, 11am to 1pm. More details below. There is an annual sister event in the Spring: Give and Grow. Both occasions encourage use of the permanent swap area in the courtyard for free exchange of anything garden-related. There’s also an Abundance table at most SB events. There are obvious benefits to satisfying one person’s “famine” with another’s “feast” and avoiding waste. And these events also provide a social occasion to meet friends and neighbours. But we are generally trying to encourage the gift economy within our community, to strengthen bonds and provide a support network ready for when the conventional money-system falls apart (as is normal towards the end of a debt-deflationary cycle like the present). On a cold but sunny Saturday in January we set off for Greengrow for their annual treeplanting day. Greengrow is a Grow your Own community vegetable and fruit growing project based at Illketshall St Andrew (between Beccles and Bungay). It’s for people who want to learn how to grow food sustainably or want to do so with others. As soon as we arrived the children formed a pack and were off, which is so nice to see and gives us mums and dads a break! On the day, we were planting pear trees and you soon fell into a comfortable rhythm: dig the hole, put in some muck mix, put tree in, add earth, cover in newspaper, attach to stake, cover with Hessian sack, et voila! Such an earthy heart warming feeling planting trees and in such nice company. There are a lot of exciting things happening at Greengrow this year. They have had two grants – one for a reservoir and rainwater/irrigation system and a second for a long greenhouse against the barn with a vegetable packing and storage area inside. As we were happily chatting and digging away, the children were gradually becoming unrecognisable through the layers of mud they had become coated with. I looked up to find my little Dan standing next to me saying “mummy i’m freezing!”. A good bowl of hot soup soon put the warmth back into us all and the kids were playing badminton over the fence and sliding down the straw bales. If you didn’t make it to the planting day and would like to find out more or get involved, Greengrow have regular volunteer days. As I’ve reported above, there are lots of exciting projects to get involved with this year. Checkout Grow your Own on Facebook for up to date info. If you’re ever feeling down plant a seed in the ground!! Please try and use sustainable modes of travel to come to these courses. As most people will need to arrive by car, lift sharing is encouraged. Graham and Nicky will contact course participants if there are any possible lift sharing possibilities. 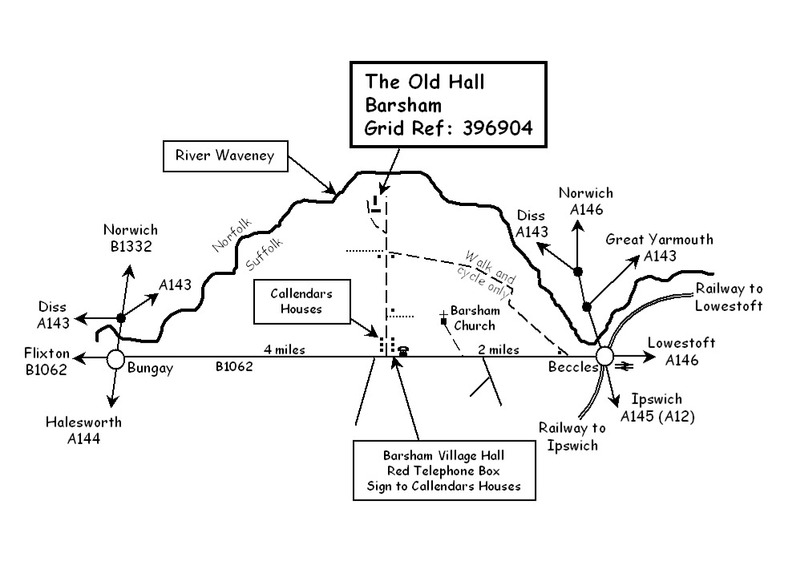 There are buses and trains to Beccles which is 2 miles away. A series of half day practical workshops looking at seasonal growing and preserving of vegetables and fruit. Bring warm clothes, waterproof, sun hat, wellies and gardening gloves as appropriate! Max. 10 people per workshop. Each workshop will cover what needs to be done at that specific time of year as well as an overview of fruit and vegetable production and preservation for the whole year. Each individual workshop will have its own distinct focus depending on the time of year. Sustainable Bungay has so far this year presented a talk on Peak Oil and Climate Change to the Rotary Club, which sparked lively interest and discussion. Also two of our core members attended a steering group meeting in Beccles where they were invited to share their experiences in the setting up of a Transition Town. We held a Sustainable Bungay strategy day on Sunday 1st at Josiah and Ellie’s house, where about a dozen of us looked at the events and activities planned for 2009. These include our Unleashing, to take place in May, and The Big Green Market in September. After the above meeting Josiah set up a google group for SB, where there are discussions, files and pages. It’s already pretty active so do have a look (there is a link in the right hand side bar). You can see the notes of our strategy day in the Files section. Several members of Sustainable Bungay went to GreenGrow’s Apple Tree planting day on Saturday 14th in Ilketshall St. Andrew, a village just down the road. It was the first clement weather for ages, and we all joined in with the plantings, which was instructive and good fun at the same time. We learnt about varieties of apple (Ashmeads Kernel, Suntan) and about grafting varieties onto rootstock, as well as how to use a sledgehammer! (for the stakes). The East Anglian Transition Gathering in Downham Market. There were several of us from Sustainable Bungay present at this day long intensive in Downham Market, organised by Transition Downham Market and Villages. There were several Open Space sessions in the morning and a World Cafe in the afternoon (for more on these meeting tools see The Transition Handbook by Rob Hopkins). This gave Transitioners from all over the region a chance for us to meet each other, network and swap experiences. Plentiful, delicious and sustainable food was provided by the hosts as well as those visiting. The Age of Stupid Film Premiere, Norwich. Six of us car-shared up to Norwich for the premiere of this British film about climate change seen from the year 2055 looking back to the present with documentary footage showing how human-caused climate change is already seriously affecting the earth and all life upon it. We also launched our first quarterly SB newsletter this month to be distributed throughout the town and to the local press. Old is the new new! With worries about climate change, peak oil and an economic recession, now is the time to value our waste. It’s great to recycle, but it’s even better for the planet to reduce and reuse. To encourage us all to help the environment and our pockets, Sustainable Bungay is hosting a Give and Take Day on Saturday, March 21st, 2009 from 10am-1pm at Bungay Community Centre. A Give and Take Day is a chance to get rid of things that you don’t want or need anymore and to pick up something that you do – all for FREE! Bring along any useable unwanted items from 10am on the day. These can be household and garden items, such as books, toys, bikes, tools, kitchenware, bric-a-brac, plants, furniture and clothes. If you don’t have anything to bring, just bring yourself and you might find something useful that you need. There will be information stands about a range of environmental issues, as well as fair-trade teas, coffees and locally baked cakes for a small donation. With help from Bright Green in Lowestoft, Sustainable Bungay will even be able to collect bulky items, such as furniture, from your home in Bungay on Friday, March 20th and can deliver these items to their new homes on the Saturday afternoon if you can’t transport them yourself. A team of volunteers will be on hand to record items donated and taken and to sort anything left over at the end of the event. Most of the remaining goods will be donated to charity shops and similar organisations and some may be sent for recycling. We hope to have nothing to send to landfill. If you would like to be a volunteer, please contact us. Mark leads a medicine plant walk in his wild neighbourhood in Reydon for SB and members of theTransition Norwich Heart and Soul group. “I’d been working with plants, especially wild and medicinal ones, for many years and in many places. So I organised a Reconnection with Nature walk with Charlotte in coastal Suffolk where we live and invited fellow Transitioners from Transition Norwich and Sustainable Bungay, where we’ve been most active, to spend the day with us getting to know some of the neighbourhood plants. 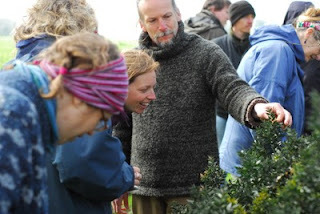 The main thrust of the day was to inspire others to get in touch with the plants and trees growing where they live. For a full slide show of the day click here. As part of the lead-up to the Unleashing on 9th May we showed the seminal Transition documentary about Peak Oil, THE END OF SUBURBIA at The Fisher Theatre (Gallery) at 7.30pm, with a discussion after the film. This is the Transition rite-0f-passage where the inititiative “unleashes” itself into the wider community and invites everyone to celebrate. We decked the hall with branches of blossoming trees and May flowers and sat at tables with different themes, ranging from Food and Farming to Reskiling. Our guest speaker was Shaun Chamberlin, author of the just-published The Transition Timeline. Kate and Josiah introduced the evening and after Shaun’s talk we engaged in round-table discussions about our Transition themes and added our insights to the Bungay 20 Year time line. En route we enjoyed Bungay tapas (locally grown, produced food cooked by ourselves), drank local beer, cider and elderflower cup, listened to music and lively conversation. Here is our press release. For a full write of the evening click here. Sustainable Bungay enjoyed a shared picnic on the Old Grammar School field. This was an informal get together open to all to enjoy this community space while it’s still there. Food was shared and everyone, adults and children alike, played games on the field during the afternoon. Summer issue of the SB Newsletter now out! Working with CRed Suffolk and the UEA Sustainable Bungay began work on a carbon audit of Bungay. We’ll take a sample of the town’sresidents based on the type of house they live in and ask acouple of dozen easy to answer questions. The analysis ofthese questions will provide us with a bench mark against which we can measure change and develop new projects (forexample, it could become clear that insulation bulk buying groups are a priority if very few people have adequate roofinsulation). The results will feed into the Town Plan that is being prepared by the Community Partnership. We also continue meeting twice a month: every last Tuesday at the Library and every third for Green Drinks at the Green Draagon. Green Drinks provide an informal opportunity to meet and chat with people who are interested in green issues – everything from social justiceand the environment through to alternative economics and sustainable building. There is a Green Drinks network all over the world. In Bungay we meet at 7.30pm every third Tuesday of the month. All welcome. The 20th Waveney Greenpeace Fair held at Hulver Farm at St Michael South Elmham was a lively fundraiser. Because of new restrictions on car parking any more people walked, cycled, took the bus and car-shared to this colourful, good-natured Fair and enjoyed its wide range of stalls, local bands and beer, campaign info and children’s activities.Transition Initiatives from East Anglia, including Sustainable Bungay, shared a stall in the tea-tent (which they also helped organise and run) to talk about the projects they are actively engaged in across the region. We are offered an opportunity to work with the Bungay Library to develop their courtyard as an activity space and growing area. Nick puts up an SB community noticeboard in the entrance and organises a set of shelves for books on the triple crunch. “We are celebrating World Car Free Day by cycling to Geldeston Locks to meet and greet the Zero Carbon Caravan (ZCC) as it passes through Bungay on its way to the UNCCC in Copenhagen (see Diary) . The ZCC travels from Wales to Copenhagen without using fossil fuel transportation; it has been welcomed (and joined) by many Transition Initiatives in East Anglia including Bedford, Downham Market, Cambridge and Norwich; on Wednesday it will proceed to Leiston, with some Bungay folk hitched to it. We hold an Energy Day at the Library with a solar panel demonstration, alternative energy information, our work-in-progress carbon audit and of course cake! Sustainable Bungay form part of the Transition East Support Group and help organise the 2nd Transition East Gathering in Diss. “We had a great day. In spite of the torrential weather 55 people from 18 different initatives travelled from Hertfordshire, Cambridgeshire, Suffolk, Norfolk and Essex and converged in Diss. Here we are (most of us anyway) just at the end of our plenary in which we summed up the events and the conversations we had enjoyed together. In the morning we mapped ourselves in time and space. We said outloud where we were 1) along a time line according to when and how our initiatives began and 2) where we were within the Eastern Region and what our plans were for the future. We then had an Open Space session, conducted by Rachel from Downham Market, with twelve different subjects from Insulation to Abundance schemes to Communication with the Media. The main slot of the day was Transition Troubleshooting in which we posted our troubles on the wall and set about finding ways of dealing with them in five different groups led by the Transition East Support Team. These included Group Dynamics, Communication (inter-group and media), Facing Profound Lifestyle Changes, Burn-Out and Fall-Out and Dealing with Officialdom. This was a new creative move within the Transition process that rippled across country to Totnes (see Rob Hopkin’s post on http://www.transitionculture.org/ today). Thousands of people flowed into into London to take part in a national demonstration called The Wave, organised by the Stop Climate Chaos Coalition, to call for action on climate change ahead of the UN climate summit in Copenhagen. Sustainable Bungay coordinated a Waveney Valley coach thanks to generous support from the Co-op. Earlier organisers, Kate and Rita flew the SB flag at the Climate Emergency Rally in Norwich and spoke about some of the solutions we were engaged in. On Dec 6th both starred in BBC’s The Politics Show, talking about Transition and the Bungay Allotments. On December 23 we all meet for a Christmas Party at Kate and Rita’s to celebrate our very full Transition year.